Use BioEngine technology to design optimal guides for one target or across multiple targets and species. Targets and guides are determined based on minimal off target interaction. Already have a target and guide? Check across one or more species for potential off target sites. Each off target report includes annotation and primer information. After a gene edit use KBioBox's extended GUIDE-Seq analysis, extracting cleavage site and frequency, correct/incorrect repairs, and translocation information from GUIDE-seq or similar pipelines. KBioBox is a technology company with expertsie in BioInformatics specialising in fast precision off target analysis and gene edit biodesign. Created in reponse to the growing need for real-time genetic sequence analysis, KBioBox's BioEngine is a powerful genomic search engine capable of searching entire genomes in minutes for even the most complex searches. BioEngine technology is build upon novel proprietary search algorythms that do not compromise speed for accuracy. Simple interactiveness and minimal computation requirements mean the technology can be used in the field or in the cloud. 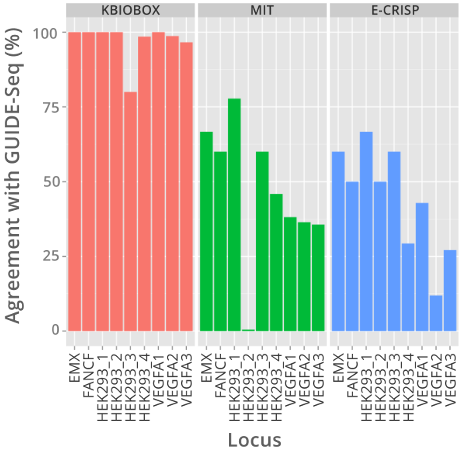 KBioBox's Off Target Analysis application predicted 96.6% of off-targets found by GUIDE-seq, the MIT and E-CRISP tools found less then 50%. 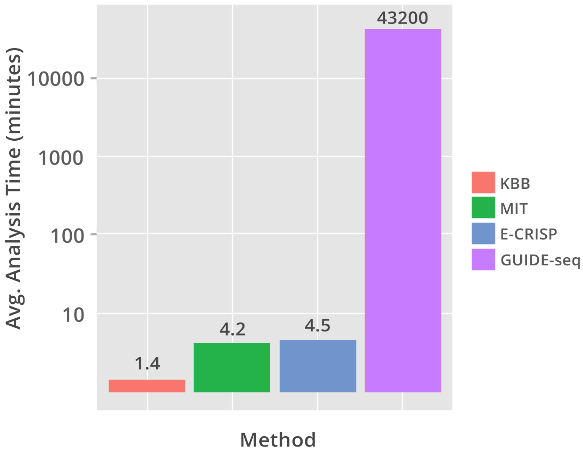 On average KBioBox's Off Target Analysis ran in under two minutes, less than half the time for the MIT and E-CRISP tools. Built upon KBioBox's BioEngine, the Off-Target Analysis tool predicted 96.6% of off-targets reported by the GUIDE-seq method in under two minutes. By comparison MIT's CRISPR design tool, and the E-CRISP tool both found less than 50% of total off-targets reported by GUIDE-seq. Ensure every component of actionable information is extracted from sequencing data, accelerating research while providing an extra layer of diligence. Paramount to fundamental research is diligent examination of data and exhaustion of possibilities. Use KBioBox's BioEngine to accelerate and enhance the research process, properly handling the tediosity of data analysis. Offset the challenges of growing regulatory compliance with complete and diligent genomic analysis. Ensure proper early stage success, benefit from genetic guidiance during development, and be overly prepared for regulatory review.